Photo courtesy of Michael J. DeVitt via Facebook. Lael called this morning while climbing Togwotee Pass. She battled a headwind early in the day on Thursday, heading south toward West Yellowstone, that slowed her pace to well under 10mph. Evan came up from behind and suggested that that the two of them push a faster pace, just to get it done. This helped, and eventually the winds died or the road turned. The two rode near each other all day and agreed to ride together for some of the dark hours of the night toward a lodge or a hotel along the road on the pass. Nighttime temperatures are cold in these mountains, and conditions will remain that way along the race route until riders drop out of the Rockies and onto the Great Plains, where hot and humid temperatures can be expected both day and night. Lael rode 240 miles yesterday with some headwinds and substantial climbing, passing through Yellowstone NP. Steffen and Sarah continue their dominance out front, Evan and Lael are steady and strong, and Kai follows close behind. Follow the Trans Am Bike Race on Trackleaders.com. The Tour Divide also started this morning in Banff, AB, CA with nearly 180 riders registered for tracking. The field includes veterans Mike Hall, Seb Dunne, Josh Kato, and Joe Fox, among many other strong competitors. The women’s field has narrowed this year, with only 12 female competitors, chasing each other and Lael’s route record. Jackie Bernardi and Jan Bennett appear to be the women to watch. The men’s race, and possibly the men’s record, is expected to be a very strong contest. Follow the Tour Divide at Trackleaders.com. Pink dot gains a few hours after her meds kick in, but yellow dot kicks back and races to the border. Thanks again to GW Neal for his digital artistry. GW is a friend through the bike community in Anchorage, and the sole employee at Fatbikes.com, which is responsible for 9zero7 fatbike sales over the internet. GW recently underwent a kidney transplant. This week, he is cranking out a solo bike tour in Maine to coincide with a friend’s wedding. GW is a huge inspiration to both Lael and I, and to the Anchorage bike community. Lael called in from Wamsutter, reporting light rain. She rode quickly from Pinedale to Atlantic City. She recorded one of the fastest times of any rider on that section earlier in the summer as she had wasted two hours at the outdoor store in Pinefale updating her GPX track to include the Wamsutter reroute. Following a quick stop in Atlantic City yesterday she continued to fight headwinds from the south through the late afternoon and evening, camping early, well before midnight. She rose early to take advantage of the still, morning air. Compared to the times of this year’s Tour Divide race, Lael is pacing between the fastest male finishers and the pink dot version of herself, the energetic wheezing version. She lost almost a half day in the mud before Lima, which is a quantifiable setback but also greatly reduced her excitement as she had been pressing close to record pace until then. Another few days of lingering rain hasn’t helped morale, although roads have been passable. This morning, she sounded good and was looking forward to sunny skies in CO and NM. She was looking forward to finishing. I haven’t told her yet, but cheap flights to Tucson might enable me to meet her at the border next weekend. It would be a little out of character, but I would rent a car to meet her, spend a day or two in Silver City with friends, then we’d both fly back to AK before leaving a little later in the season. I am obligated to work for a few more weeks. I have never owner a car or rented a car, although I did drive for a few years in high school. Lael only has a driver’s license so that she could legally operate a pedicab in Key West, FL back in 2008. Don’t ever let her drive your car– not that she will want to– she’s a terrible driver. Hoping for clear skies and dry roads through CO and NM. All images from Tents and teepees; the Great Divide Basin from my ride from Alaska to New Mexico, 2012. Lael arrived at Flagg Ranch yesterday in pouring rain. She continued through the afternoon over Togwotee Pass and up Union Pass, and mostly, the rain stayed away, returning as a series of showers through the night. As she rode in the dark in the forests and meadows atop Union Pass, adjacent to the tall peaks of the Wind River Range, she was surrounded by lighting. At about 2AM, she had descended off the pass and into the valley, and bivvied under a sign, which provided some additional protection from the weather. She stopped in Pinedale to resupply at a real grocery store, and slammed a kombucha and a bottle of kefir on the spot. Today she rides along the western edge of the Winds, around the south end of the range to South Pass City and Atlantic City, and into the wide open Great Basin. She should be in Colorado tomorrow. French dip, pork sandwich, and quesadilla. I’ll take the pork sandwich and the quesadilla. And can you wrap that in foil? Tour Divide legend Jay Petervary drove up from Victor, ID to deposit a rental SPOT Trace device along the roadside for Lael. Matthew Lee, Tour Divide organizer and Trackleaders affiliate, has a fleet of rental units and a few remained in Victor following the Fitz-Barn ride this week. Collectively, Matthew and Jay have ridden the Divide twelve times. Photos: JayP. Lael arrived in Lima late in the morning on Thursday, after the roads dried enough so that her wheels would at least spin through the frame. The areas with sun were mostly dry, although shaded regions of the road were still caked in mud. She resupplied at the store and washed in the bathroom. Sunny skies and wide open gravel roads lay ahead of her as she exited the state of Montana for a second time this year. Crossing the Continental Divide at Red Rock Pass into Idaho, she descended to a store just before close and proceeded onto a section of rail-trail which is famously sandy and corrugated. Leaving the store, she rode one handed on the sandy trail and described how she almost quit yesterday. The weather stopped her progress entirely. She faced a 24 hour gastric issue on the same day that forced her to stop every few minutes. It was not her best day, and did not reflect the reasons which brought her back out on the Divide for a second time in one summer. By the time she got to Idaho she had shifted her focus forward and was excited about the strawberries she had bought, her first fruit since Banff; the Cheetos she packed, reminding us of all the Nik-Naks sold in South Africa and Lesotho; and of the Monster Coffee energy drink she bought, which somehow signaled a commitment to continuing. Although, she quipped, “I don’t want to eat anything ever again”. These foods were just tokens. This morning, Lael retrieved the plastic bag hanging from the sign of the Squirrel Creek Ranch containing a SPOT Trace tracking device and a few zip ties. She cycled the power button several times, as Matthew prescribed, and continued riding into Wyoming. The SPOT Trace is a newer device, mostly designed as an asset tracker for trucks, boats, and motorcycles, and is about half the size of the new Gen 3 trackers. It functions as a full time tracker, without any customizable features and without an SOS button. Great thanks to Matthew and Jay for collaborating to get another SPOT to Lael! On his record-setting 2012 ITT of the Divide, Jay also lost his SPOT tracker and received a new unit in Lima, MT. Updated10:54AM MT, Saturday 6/20: I have been in contact with Scott Morris about the situation and have been assured that Lael can proceed along her track through Rawlins if needed, although there may be road construction on the route which could inhibit progress and force her to find a new route around the route, or into a pilot car. However, in his opinion, that route would count for a record as it is the same route as Eszter Horanyi rode to set the current female record in 2012. However, I’ve made contact with the Great Outdoor Shop in Pinedale, WY where one of the owners, named Josh, has agreed to download the Tour Divide 2015 track and upload it to Lael’s Garmin eTrex 20. Josh and the staff at the Great Outdoor Shop have been super supportive. Thanks! Hoping the new upload is successful. Lael has ridden two very strong days. I spoke with her yesterday in Lima when she was still unsure about her health, but without imminent threat of respiratory distress she chose to proceed. It seems to have been a worthwhile gamble. She ended the day yesterday at 182.5 miles, opening a gap of 50 miles ahead of the next female competitor. This was her first healthy day on the bike since the start of the Tour Divide. Today, she rode more than 190 miles across Idaho and into Wyoming. But this evening, she appears to have ridden off route and is camped along US 26. I’ll clarify the situation to the best of my ability. The Tour Divide has followed the Great Divide Mountain Bike Route as published by the Adventure Cycling Association since the race began over a decade ago. The TD is an unofficial event which claims only to suggest a start place and time, and accepts no liability for the competitors. There is no entry fee (save for a tracking fee), nor prize money Officially, there are no organizers, but there are two people who do a lot to support the event and keep it alive. A great thanks to Matthew Lee and Scott Morris for being the wizards behind the TD. There is a lot of work involved in not being an organizer of an event. There is a Tour Divide website, officially, and I think Matthew operates the site. At least, Lael had to send an e-mail to Matthew via the contact form on the TD site to sign up for the tracking service. Nowhere else was this procedure described. I only learned this after sending Lael’s SPOT details directly to Scott, who referred her to Matthew via the TD site. The TD site is mostly inactive, last updated with LOIs, results, and resources in 2011-2012. The home page lists the start date for the 2014 TD. The Rules page indicates activity in 2014-2014. There is a TD Facebook page with some rider photos from years past, which has been inactive during the subsequent year and does not appear to be a significant resource. There are various discussions on the forums at Bikepacking.net, but none claim to be official resources for the TD. Back in 2004, GPS devices were far less common; today, they are ubiquitous. The Adventure Cycling Association has modified and augmented the Great Divide Route in successive map editions to benefit their target audience, cycletourists. The Tour Divide accepts most, if not all of these changes to the Main Route, as they are published. The Tour Divide accepts two paved Alternates from the Main Route described on the ACA maps in New Mexico as the de facto race route, as the chance and risk of wheel-sucking mud is so high it would regularly interrupt the event. In recent years, the Tour Divide elected to use a new ACA Alternate along the actual Continental Divide Trail outside of Silver CIty. In 2012, the Tour Divide included a section of the Gold Rush Trail from Boreas Pass to Como, just outside of Breckenridge, CO. The Gold Rush Trail has never been shown on the ACA maps, and is the first deviation of the TD from ACA material. Such diversions to the broad dirt roads of the Divide are welcomed. Turn-by turn cues were provided for this new section, written in the style of the ACA maps. The change was also included in the GPS file available that year and the reroute was explicitly included on the “Rules” page of the TD website. This year, changes were made to the Tour Divide route, published on 5/22 as a GPX file only, without mention of the changes on the TD “Rules” page, and without written cues. One of the two changes– both are in Wyoming– is listed on the ACA maps but the other is said to be an original creation by Matthew Lee. The second is not written as cues or printed as a map anywhere. Lael left Anchorage on 5/14. We uploaded GPS tracks and maps to her Garmin eTrex 20 on that morning, the last task before leaving town. We sourced the file from the Riding the Great Divide page on Scott’s Topofusion.com site. Listed below a file labeled GDMBR_2011_v2.gpx we downloaded a file labeled TourDivide2014_v2.gpx. This was the most recent file listed, and the subtext indicated that it was the “official” route. Lael proceeded to Banff, riding 2140 miles in 19 days. In Banff and Canmore, she rested, exchanged gear, and prepared the bike for the race. It was not until this evening (6/19) when Lael continued down US 26 while descending Togwotee Pass that I discovered her route differs from the route shown on the Tour Divide 2015 Trackleaders page. I revisited the Riding the Great Divide page at Topofusion.com and discovered a new route had been published on 5/22. The TD website does not indicate the new file nor the changes, and the “Rules” page indicates details relating to the 2013 and 2014 TD route only. I believe that the route Lael is currently riding up to Union Pass has been the TD route for all years past. Currently, the historical data on Trackleaders.com for Jay Petervary’s record-setting ride appears to be off-course, as it rides along the old route through the Great Basin to Rawlins, which continues to be the ACA Main Route. The Wamsutter diversion is not listed on any ACA publications. Lael is following the latest Tour Divide track that was available on 5/14, and has not had access to a computer to update her files, not that either of us knew a new track had quietly been published. She is aware of all the changes made to the route prior to 5/22/15, as detailed on the TD website, and is dutifully following the route to the best of her knowledge. She is following a route which has been recognized for past victories and records. She has camped for the night and will reconnect with the red line on Trackleaders in the morning, after a short-steep climb back toward Union Pass. She will– without further instruction– continue along the ACA Main Route through the Great Basin and Rawlins. She will, however, follow the Gold Rush Trail, the CDT near Silver City, and both paved sections between Cuba and Pie Town in NM. Now that it appears her health has returned, Lael has rejoined her intended pace. I hope this confusion does not challenge her standing with the “officials” of the Tour Divide. Again, your contributions to the bikepacking community are essential and are greatly valued. Thank you. Divide-style riding– the open dirt roads that are influencing a new generation of cyclecampers– has provided me with a home for the summer. Daily challenges and joys come from climbing and descending the skeleton of the American west, while every evening is topped with delightful campsites, for free. The Great Divide Route is the Trans-Am Route of the modern day, as Fargos and Trolls are the equivalents of old Trek and Fuji touring frames. The Divide is the fusion of our American cycletouring heritage and several decades of mountain biking– it’s a way of connecting the dots and getting away from it all. Most road maps facilitate travel along the paths of least resistance, though river valleys and along interstate highways. Lesser known routes encounter greater resistance– in route planning and topography– but uncover the uncommon character that is hidden in the folds of the land. The Great Divide Route is changing the way American cyclists look at cycletouring and is both ready-made and quite rideable, lessening the resistance to “getting away”. While a single day’s ride on the Divide might be challenging, the open road ahead is an inviting yellow brick road of logistic simplicity. Turn-by-turn directions and comprehensive resources for cyclists (groceries, water, lodging, camping, police, etc.) are listed on the maps, in addition to elevation profiles. Concerns that the Divide reaches deep into the wilderness, days away from food and resources are unnecessary. Every few days the rider encounters a proper grocery, and water is not an issue in most places; when it is less plentiful one simply carries a little more for the duration described in the maps. If the Divide calls to you, I’m telling you that you can! You still have to ride your bike up and over mountains, but it couldn’t be any easier. The Great Divide Route is the realization of an idea with roots in the original Bikecentennial route (renamed Trans-Am), which was meant to uncover America’s backroads. As originally designed, the cross-country route included miles of gravel farm roads inspired by terrain encountered on the Siples’ Hemistour ride. Overwhelmingly, the first wave of Bikecentennial riders complained about the hardship of riding dirt on the typical 27×1 1/4 (630 x 32mm) tires of the time. The Siples had ridden handbuilt 650b wheels laced to Campagnolo hubs, with an approximate 40mm tire. Edit: I’m currently researching the tires used on Hemistour, as they are simultaneously and incongruously referred to as 650B (584mm) and 26 x 1 3/8 (590mm). June Siple has a record of equipment used, and may soon shed some light. Ten years later as ATBs exploded onto the market. riders finally had the appropriate equipment to explore these dirt routes, especially the more challenging rides into the mountains. Meeting over margaritas and Mexican food in 1994, as legend has it, Michael McCoy conspired with ACA staff to design a dirt route along the spine of the country. Within the year the Great Divide Route was born, and the rest is (recent) history. Today, more people are touring on mountain bike tires and mountain bikes, in the mountains. Riders are discovering the value of lightweight packing as backpackers have known for years. The combination opens up the opportunity to ride high mountain roads and singletrack for multiple days at a time. My own evolution as a rider mirrors the history of American cycletouring, and after a few long years the final and most contemporary piece to the puzzle will fall into place on the Colorado Trail, and beyond. They call it mountain biking or bikepacking, but it’s still just a bike ride. I sleep atop mountains and passes whenever the weather is clear and calm, with only my sleeping pad and bag on a nylon groundcloth. Since entering Montana, most nights have been spent en plain air. I keep most of my gear packed away, but will remove my cookset for some dinner or tea in the evening. Now out of grizzly country, I gave my bear deterrent spray to some CDT hikers and I can leave the stove set up for the morning. When I’m feeling especially organized and indulgent, I’ll prepare the pot with clean water so that it can be heated as soon as I awake for coffee or tea, like the auto-brew setting on your home system. The Penny Stove that I use was built almost a year ago while in Steamboat Springs, and has seen about 150 days of use. The steel Klean Kanteen is versatile in that I can defrost frozen water from a cold night, or sterilize stream water right in the bottle. An enameled steel camping mug isn’t much heavier than popular Lexan or plastic models, and can similarly be used for cooking or heating water. While I technically only carry one 0.8L cookpot, these versatile vessels allow more creative meals and hot drinks. A 1L plastic drink bottle contains fuel, of which I’ve mostly been sourcing the yellow bottles of Heet (automotive antifreeze, methanol). In bigger cities I can buy a full liter of ethanol, or denatured alcohol at paint and hardware stores. In France, corner stores sold a 95% concentration of ethanol as a household cleaner, always in an inspiring floral or citrus fragrance for two euro. In Mexico, “alcohol industrial” can be had at some paint stores, which wasn’t an entirely reliable source. I finally realized that the rubbing alcohol sold in Mexican pharmacies was a 70-90% concentration of ethanol, whereas rubbing alcohol in the US is almost exclusively isopropyl alcohol. Isopropyl burns incompletely and leaves a sooty mess on your pots. Inevitably, it makes a sooty mess on other things until you look like a coal miner on a bicycle. For reference, higher concentrations of isopropyl alcohol burn just fine, if necessary. With tired legs from several weeks of riding without a rest, I find cover during the heat of the day along the Little Snake River. Of course, this was a fine swimming spot, if a little shallow. My transition into Colorado signals a more temperate climate– surface water and shade quickly reappear after a few scorching days in central and southern Wyoming. Aspens provide wonderfully cool shade while climbing, and a stark contrast to western skies. Steamboat Springs is a tourist town, a ski town, and a little hard to crack at first. Local businesses are busy crafting and creating, and a visit to the Moots factory is inspiring (10 AM on M-W-F). Kent Erickson, who started Moots in the 80’s, now crafts fine titanium bikes in a space shared with Orange Peel Bikes, a must-see building and a fine shop. Smartwool offices are in Steamboat as well, and my host for the night offered some socks and a lightweight merino sweater– he’s a quality control agent for the company, and is full of socks that didn’t make the cut. Finally, I contacted Big Agnes in advance for some tent repairs after four years of hard use. I’m constantly seeking better solutions to equipment, but my Big Agnes Seedhouse SL2 is hard to beat and while I’ve looked for other options with curiosity, nothing improves upon the blend of durability and light weight. It sleeps two, but is light enough to carry for solo adventures. It is conveniently freestanding, which is great during the buggy season and the rainfly can be used without the mesh tent body for good ventilation during a summer rain shower. In more extreme weather, a total of 13 guy lines ensure a solid stance against the wind and rain. While in town last year they repaired a large tear in my rainfly due to a zipper mishap; this year, some sections of my tent poles needed replacement and a finicky zipper was repaired. It’s nice to have contact with real people, with real skills and expertise to help sort out technical issues. If I had gone to REI, they would have shrugged and replaced the entire product. Repairs are a much better solution, and the cost to get me back under cover was only $10. The ride from Steamboat Springs to Kremmling is pleasant and familiar as I’ve now ridden the route over Lynx Pass three times. It was part of my path from Boulder to Steamboat last fall to meet Cass and Nancy in early October for some Divide riding. Check out Nancy’s first day of bicycle touring, climbing at 8000ft over Lynx Pass on dirt roads in the snow! At the same time I ran into Greg Mu on the road, riding a look-alike Surly Troll to what Cass was riding. Whose Troll was born first? Greg insists it was his. We all rode together for a period and had a great time, despite cold nights and some early season snow. I overheated and perspired through my first freezing night, even though I was sleeping without a tent After buying and returning a half-dozen sleeping bags to REI over the last few years, I finally found my ideal bag at The Trailside in Missoula, MT last fall. The Mont-Bell U.L. Super Spiral Down Hugger 3 is filled with high-quality down and is rated to 30, which is an accurate description of it’s warmth. The bag is constructed in a spiral stitch pattern with elastic stitching which ensures that the down is close to the body while sleeping, but that nighttime movements are not constricted by a narrow bag. The advertised weight of the bag is 1 lb. 6 oz., and compresses to the size of a cantaloupe or smaller. An Etowah vapor barrier liner (VBL) from Rivendell keeps me warm down to 10 deg, with a lightweight down jacket and a blend of Ibex and Smartwool long underwear. I have not been carrying the VBL or down jacket through the summer months. My host in Kremmling is a recent Pugsley owner, with a glowing enthusiasm for fat tires. Without saying, we got along just fine. In a few weeks, he’ll set off for the Divide with my maps on his new fat tires. There are great camping and riding opportunities north of town, most of which is BLM property. Camping along Muddy Creek is recommended. Near the top of Middlewood Hill, 7965 ft; about 30 miles south of Rawlins, WY on the Great Divide Route. Purple first-generation Surly Pugsley frame with Marge Lite rims and Larry tires; Shimano dynamo and Supernova E3 Pro headlight, B&M Toplight Line Plus taillight; Salsa Cowbell 3 Handlebars with modified Ergon grips, Shimano bar-end shifters and Cane Creek V-brake road levers to Avid BB-7 brakes; homemade coruplast fenders of “Joe Miller For Senate 2010” (Tea Party) signage, modified Nitto M-18 rack as bag support, and Salsa Anything Cage under the downtube to hold a 64 oz. Klean Kanteen. Luggage includes a Carradice Camper saddlebag; Revelate framebag, front Pocket and Gas Tank; Sea-to-Summit drybags and compression e-Vent drybag fill the gaps. It’s a bike and even with three days of food, an Olympus E-PM1 camera, MacBook Air, and a spacious Seedhouse SL2 tent, it rides like a bike. Anymore, the oldest part on the bike is a pair of vintage Suntour XC-II beartrap pedals, purchased used from Pacific Coast Cycles in Carlsbad, CA before riding into Mexico. Footloose, I enjoy a good platform pedal and a real pair of shoes. I’m almost nine months into my “One bike for all seasons” experiment– to date, I have ridden over four months and 2000 miles on fat tires through a snowy Anchorage winter; 3500 miles on Schwalbe Big Apple tires while touring paved and dirt roads from Alaska to Montana, and about 1000 miles on Surly Larry tires on the Great Divide Route from Bozeman, MT to Steamboat Springs, CO.
A reader, Dylan, has generously shared a PDF of Ian Hibell’s Into the Remote Places. If anyone is interested in this out-of-print classic, email me at nicholas.carman@gmail.com. Leaving the Winds and the woods behind and riding on with a conglomerate ball of day-old donuts from the Pinedale supermarket, I shoot for the Great Divide Basin. I’m to be in Denver in just over ten days and I’ve found a peaceful groove of riding and resting and reading and eating and riding; the pace is not challenging and the rhythm is intoxicating. I’d rather put time in the saddle now and relax upon reaching my target, and the mountains of Colorado are a better place to spend some lazy days with ready access to shade and water. The Great Basin is topographic and hydrologic fantasy where water neither drains to the Pacific or Atlantic Oceans, instead contained by an enclosed basin. In this dry climate at 7000 ft, most of what what falls from the sky eventually evaporates. It’s fantastically beautiful, but it’s not really a place to hang out, especially by oneself. Spending a restless night in a teepee in Atlantic CIty, WY, I depart in the cool morning and shoot for the Sweetwater River– this will be my last swim for a while. Ten miles further is Diagnus Well, a constantly gurgling pipe designed to create a wetland in the desert to sustain livestock. It smells a pungent saline swamp, and two lambs are tied to sagebrush, bleating for reprieve from heat and hunger. An empty, but lived-in trailer stands nearby. I give the lambs some water. While cooking grains in the shade of a fencepost, a vaquero arrives on horseback with a white dog with a prominent ribcage. He comes close, and licks the remaining grains and salt from my pot without asking, kicking sand. “Go away”, I demand half-heartedly. He’s hungry, and I’m tired from the heat. For a moment, I’m taken back to Mexico and the emaciated cattle of Baja. Ranching in the sage desert at 7,000 ft isn’t easy. I briefly debated with a man in Atlantic City who complained about ” the people from south of the border” that were ruining the economy of his home state of Colorado. In the desert, a lone vaquero starves with his dog and two lambs. Is this what he refers to, or is the the hardworking men and women doing the other jobs we’re too disgusted and too lazy to do? This same discrimination has plagued this country for centuries, and has no doubt affected your family. Willfull outsourcing of labor and consumers unwilling to buy local goods are more at fault than hardworking Mexicans, regarding the current state of things. We raised our voices talking about wild horses and wolves, but discrimination disguised as patriotism is most enraging to me. This is pretty typical Wyoming politics as I understand. I find it powerful to retort, “where did your family come from?”. WIth just under three liters of water, I ride onward from the gurgling pipe in the desert. For a time, I am enchanted with the vast moonscape of the Basin, but soon enough I am thinking about water and shade, with no relief save for a snow fence and my warm bottles of water I drape my groundcloth over the fence slats, providing shade, but it also blocks the cooling west wind. I savor warm salty sips until within ten miles of the A&M Reservoir, then I open my throat and empty the end of the bottle, throttling onward. I’m not dying of thirst, but I imagine bringing my lips to damp sand in the desert in search of relief, or as Ed Abbey suggests, biting on a small pebble to instigate salivation and to relieve thirst. Luckily, my map shows a state managed reservoir which provides cool, clean water and a place to calm my sunburnt skin. Only 55 miles, that was a long time without a swim. Cooled and cleansed and full of water I make quick friends with CDT hikers, and then make a break for it. Racing downhill away from lightning bolts, I relieve pressure from my tires to smooth the terrain at 24 miles an hour, and lean into a sidewind– like a sail, the framebag sends me sliding into the thick thundercloud air. This is the first thunderstorm of the entire trip and I reach Lamont quickly, taking refuge in the Annalope Cafe. That night, I sleep in another teepee, this time provided by a woman I would never meet– a devout Christian– who has helped passing cyclists for years. The Divide Route passes within a few miles of Lamont and the popular Trans-Am bicycle route. Wells in the desert and relief from rainclouds– Wyoming provides. Awake to clearing skies, I stop into the Annalope Cafe for some fuel for the ride to Rawlins. Indeed, the desert is constantly changing, but what’s for dessert? A great thanks to “LB”, who I never did meet. The teepee was much appreciated as my tent is currently in partial disrepair. It will be back in full service after a visit to the red house on Oak Street, Big Agnes headquarters and repair shop in Steamboat Springs, CO. Bed by campfirelight, awake by sunlight. Smoke fingers linger over my down bag in the early morning; I always take time to admire how lofty my bag has become by sunrise. I played games with REI for years returning bags, and finally bought a better bag at a local shop in Missoula last summer. I’m fully content with it, and a vapor barrier extends the range at the end of the season. Toss the coals about, lay a log on top and heat some water– coffee and cream of wheat will get me where I’m going. This is my last night in the woods for a while, as I’m into the great wide Wyoming open for a week of sage and sunshine. I can count the campfires I’ve had over the past four years on one hand, and this seemed like an occasion to burn a little bit of the woods. The campsite was littered with rusty cans of Texas ranch-style beans and shotgun shells– it wasn’t dirty by USFS standards, but well used. I took the opportunity to use it some more. If i’d had a big gun, I woulda shot it. Two days ago I climbed away from Idaho on the Reclamation Road between Yellowstone and Teton National Parks into a thick August swarm of tourists. Yesterday I climbed away from Teton tourists to the not-so-secret handicap accessible swimming hole at the top of Togwotee Pass. Descend twenty miles, then climb back to Union Pass and ride until dark. From my camp at 9000 ft, today is all downhill, nearly, and the final miles into Pinedale are paved. Ice cream and wifi aren’t too far off, despite fifty miles of riding. I rest my forearms on the bars and find my aero position– I’m there by noon. The Great Divide narratives underscore the pretense of long stretches without water, the presence of bears and to be off the trail by “mid-October at the latest”; mostly I count long stretches without a half-gallon of ice cream for $4.44, and the fact that I’m “in bear country” is nothing new. The riding is occasionally challenging, but the route is a logistical walk in the park with the help of the ACA maps. It’s dangerous to visit supermarkets with big eyes and an empty stomach as 4 for $7 promotions of Keebler cookies and day old donuts are tempting– a hungry sucker, I had to find a way to pack a dozen day old donuts and a half-gallon of soymilk. The soymilk fills the Kleen Kanteen, but doesn’t last long. The donuts are now a ball of smashed donuts, and that’s just fine. This is the first “super”-market I’ve visited since Butte, and the experience is overwhelming– they have everything. Not interested in an $8 campsite– the campground attendant was incredulous at that, and rude– I rode the final hour of sunlight to the Teton Nation Forest boundary. This is public land and I figure my tax dollars are hard at work helping the trees grow so that I can sleep amongst them. Actually, the USFS is a road builder above all else. They build a lot of roads, and a gated logging road provides perfect camping. I awake to climb up Togwotee Pass, to a 46 mph descent down the other side, and a climb back up to Union Pass. At 15 mph the Surly Larry tires hum, at 25 they sing, and at 45 they scream. 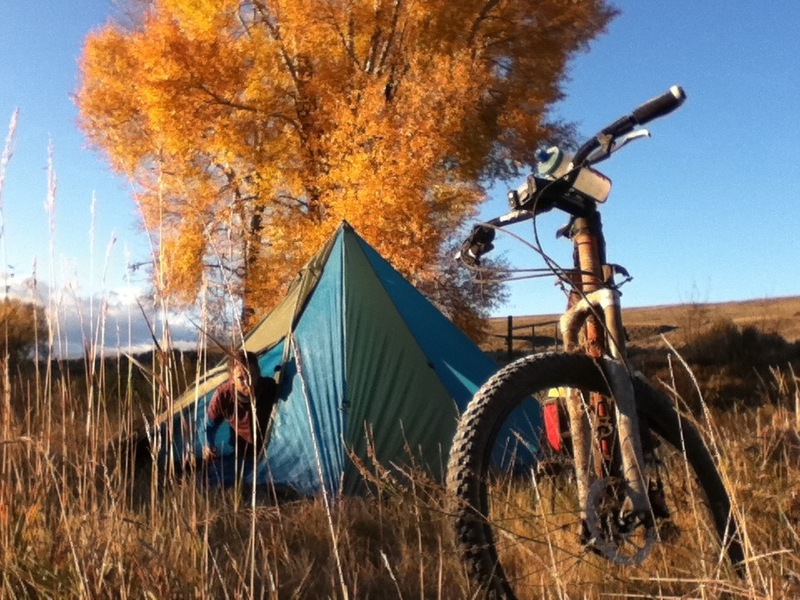 Making camp by campfirelight, I awake to descend two-thousand feet to Pinedale over fifty miles– let the fat tires roll.